on Sunday, writes Geoffrey Wheatcroft in a New York Times Magazine article whose title compares England's "oddballs", "boor[s]", and "buffoon[s]" to the members of the American Tea Party (probably not an original idea of the English journalist, but a decision made by the New York Times's editors) and which lets loose with expressions such as "Nigel Farage and his team of oddballs", "the proto-apostle of a revived free-market creed", "Farage’s vulgar assault", "the E.U. as its central obsession", and "you might charitably say that [Godfrey Bloom, a UKIP Euro M.P.] probably isn’t a real bigot, just a boor and a buffoon." The EU elections are Sunday, but the UKIP posted big local wins today (cheers to Instapundit; incidentally, Matt Chorley and Tom McTague's Daily Mail report has been considerably updated and lengthened since it first appeared). He has himself been a member of that body for 15 years and will doubtless be re-elected, although he belongs to it only to attack it, and his party exists to destroy it, or at least British participation in it and in the European Union. … Outside, there was a knot of demonstrators as well as a BBC television truck: Farage is news. Two protesters held a banner that said (incorrectly as it happens) “Nigel Farage is a banker,” and one woman had a small handwritten placard reading, “They called Hitler charismatic too.” If the comparison is hyperbolic, she’s hardly alone. For all his apparent geniality, Farage is seen by plenty of people as a pernicious figure and his party as a danger to the political health of the nation. … That kind of brazen cheerfulness is part of his appeal, along with his act as a man of the people (albeit an expensively educated man whose father was a stockbroker). … Much of UKIP’s appeal is resentment at a fast-changing world and yearning for a lost — and no doubt largely imaginary — England, whispering the last enchantments of the 1950s. It may be retrograde, but some of it is harmless. Farage told me that one of the proudest moments of his life was appearing on “Test Match Special,” the BBC radio program covering cricket. Explaining that to American readers is a little like describing the arcane rites of a tribe in the Borneo rain forest, but anyway, a test match, or an international cricket game, say between England and Australia, lasts from 10:30 in the morning to 6 at night for five days running. … If anything, Farage’s brashly rebarbative manner and checkered career have made it too easy for the respectable consensus to dismiss him and to overlook the fact that not everything he says is wrong. The European Union really is bloated, corrupt and undemocratic. Its ruling elite is indeed an unaccountable, self-perpetuating and self-satisfied oligarchy. A single currency embracing countries wildly disparate in economic performance has been a disaster for many, leaving tens of millions of young people in Greece, Spain and Italy with no jobs, no money and no future. The grandiose posturing of that oligarchy in Brussels or Strasbourg is embarrassing in the circumstances. They speak as if the “European Union” were some equivalent of, and rival to, the American Union, when in reality the member states can’t agree on anything from banking policy to Ukraine. In one European country after another, nationalist or nativist or frankly racist parties — and UKIP has had a tinge of all these characteristics — are on the rise. It’s possible that many representatives of such parties will sweep into the European Parliament this week, but if that happens, it will not be good enough to blame those who vote for them. To the contrary, it will be hard not to feel that the complacent Eurocracy had it coming. 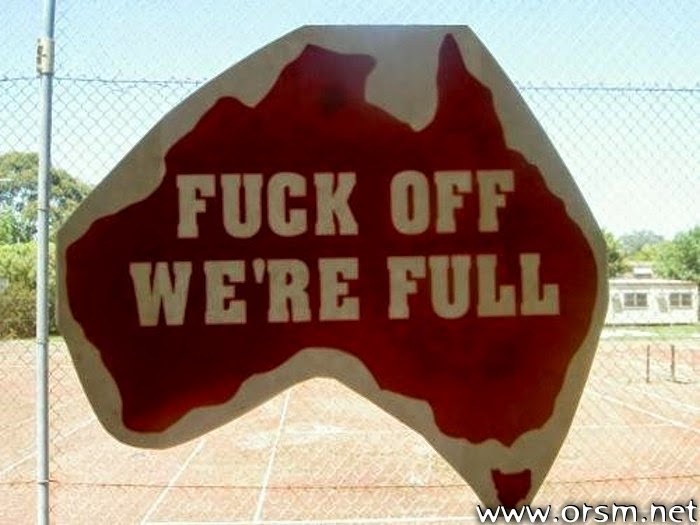 Down Under, the Immigration "Rules Have Changed"; "Anyone seeking to illegally enter Australia … will never make Australia home"
You will not make Australia home. The rules have changed. Check the facts. Anyone seeking to illegally enter Australia by boat will never make Australia home. It is the policy and practice of the Australian Government to intercept any vessel that is seeking to illegally enter Australia and safely remove it beyond our waters. People who travelled to Australia by boat without a visa will not end up in Australia; they have been sent for processing in Nauru or Papua New Guinea. They won't be able to work, and could be waiting a long time for their claim to be processed. Australia has the toughest border protection measures ever. The Australian Government has announced that no temporary or permanent protection visas will be granted to anyone who arrives in Australia by boat without a visa until further notice. You can still come to Australia through lawful migration. Asylum seekers are still processed for permanent settlement in Australia if they migrate through the humanitarian, skilled worker, or family migration programmes. People who migrate to Australia lawfully are given priority when sponsoring their family to come to Australia. the event, part of an energetic push for votes by France’s surging far right ahead of elections this week for the European Parliament, also promoted an agenda distant from the customary concerns of conservative voters: why Europe needs to break its “submission” to the United States and look to Russia as a force for peace and a bulwark against moral decay. While the European Union has joined Washington in denouncing Russia’s annexation of Crimea and the chaos stirred by pro-Russian separatists in eastern Ukraine, Europe’s right-wing populists have been gripped by a contrarian fever of enthusiasm for Russia and its president, Vladimir V. Putin. “Russian influence in the affairs of the far right is a phenomenon seen all over Europe,” said a study by Political Capital Institute, a Hungarian research group. It predicted that far right parties, “spearheaded by the French National Front,” could form a pro-Russian bloc in the European Parliament or, at the very least, amplify previously marginal pro-Russian voices. … among far right groups, the sympathy for Russia and suspicion of Washington are in part tactical: Focused on clawing back power from the European Union’s bureaucracy, they seize any cause that puts them at odds with policy makers in Brussels and the conventional wisdom of European elites. But they also reflect a general crumbling of public trust in the beliefs and institutions that have dominated Europe since the end of World War II, including the Continent’s relationship with the United States. Some of Russia’s European fans, particularly those with a religious bent, are attracted by Mr. Putin’s image as a muscular foe of homosexuality and decadent Western ways. Others, like Aymeric Chauprade, a foreign policy adviser to the National Front’s leader, Marine Le Pen, are motivated more by geopolitical calculations that emphasize Russia’s role as a counterweight to American power. Russia has added to its allure through the financing, mostly with corporate money, of media, research groups and other European organizations that promote Moscow’s take on the world. The United States also supports foreign groups that agree with it, but Russia’s boosters in Europe, unlike its leftist fans during the Cold War, now mostly veer to the far right and sometimes even fascism, the cause Moscow claims to be fighting in Ukraine. Hungary’s Jobbik, one of Europe’s most extreme nationalist parties and a noisy cheerleader for Moscow, is now under investigation by the Hungarian authorities amid allegations that it has received funding from Russia and, in a case involving one of its leading candidates for the European Parliament, that it has worked for Russian intelligence. No longer dismissed, as they were for decades, as fringe cranks steeped in anti-Semitism and other noxious beliefs from Europe’s fascist past, the National Front and like-minded counterparts elsewhere on the Continent are expected to post strong gains in this week’s election, which begins on Thursday in Britain and the Netherlands and then rolls across Europe through Sunday. But they are unlikely to form a cohesive bloc: Nationalists from different countries tend to squabble, not cooperate. Nigel Farage, the leader of the United Kingdom Independence Party, a group zealously opposed to the European Union, and a critic of American foreign policy, is already engaged in a bitter feud with Ms. Le Pen. But Mr. Farage and Ms. Le Pen have at least found some common ground on Russia. The British politician recently named Mr. Putin as the world leader he most admired “as an operator but not as a human being,” he told a British magazine. Ms. Le Pen has also expressed admiration for Mr. Putin and called for a strategic alliance with the Kremlin, proposing a “Pan-European union” that would include Russia. The view that Europe has been cut adrift from its traditional moral moorings gained new traction this month when Conchita Wurst, a bearded Austrian drag queen, won the annual Eurovision Song Contest. Russian officials and the Russian Orthodox Church bemoaned the victory — over, among others, singing Russian twins — as evidence of Europe’s moral disarray. President Truman never showed public regret for unleashing atomic bombs on Japan. In this letter to Chicago Sun Times reporter, Irv Kupcinet, written on August 5th, 1963, he thanks Kupcinet for a favorable column he wrote about him and his decision to drop atomic bombs on Japan.